A renovated 2 bedroom caravan in Bude within walking distance to the beach. A 2018 renovated 2 bedroom caravan at a newly revamped site with heated pool. A newly renovated, clean and comfortable caravan at a newly revamped site, within walking distance to Bude's award winning beaches! 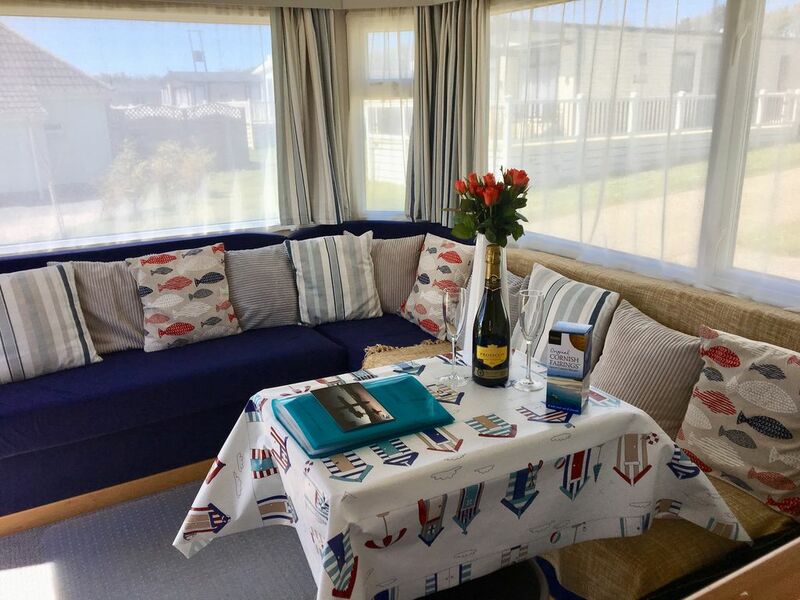 The caravan has been revamped in 2018 with a modern nautical theme and fresh carpet, curtains and upholstery throughout. There are 2 bedrooms which sleeps 4 in a double bedroom and a twin bedroom. The kitchen is fully equipped with a full size gas cooker and fridge freezer. It also has a microwave, kettle, toaster, cutlery, crockery, cooking pots pans and other utensils including an iron and ironing board. The lounge has built in seating with a collapsible table and stools, as well as a TV and DVD player. The bathroom has a shower, sink and WC. There is a gas heater in the lounge and a free standing electric heater for use anywhere in the caravan, with double glazing throughout. The caravan is situated in a quiet area of the resort, opposite the onsite laundrette and a 2 minute walk from the bar, restaurant, shop and clubhouse. Bude Holiday Resort is a friendly place for families, couples and solo travellers. The park underwent a huge upgrade in 2017 with the addition of a new heated outdoor pool (from late May – mid September). The park also has a launderette including washers, dryers, ironing board & hand washing facilities. On site there is an adventure playground and an amusement arcade, a bar, beer garden, shop and cafeteria. All of which are accessible to our guests. Bude Holiday Resort is perfectly situated beside the National Trust Coastline with its own private access to the South West Coast Path. The picturesque town of Bude and its beautiful beaches Crooklets and Summerleaze, are within walking distance of the Resort. The town and surrounding area offers many activities such as surfing, angling, coastal and country walks, cycling and golf. There are many fine Pubs, Cafe's and restaurants to suit all tastes as well as quaint shops to peruse. With its fabulous sandy surfing beaches, rugged countryside and its own natural Sea Pool, you can see how it has been named the UK’s Best Coastal Town in the British Travel Awards for several years in a row. You can park next to the caravan on the resort. There are a variety of car parks around the town and beaches, as well as many taxis and buses to other surrounding areas. Please note: Any booking made is for a privately-owned caravan. Peter Bull Resorts Ltd has no association with the hire of this holiday home or legal responsibilities associated with a holiday booking. Peter Bull Resorts Ltd holiday accommodation terms and conditions DO NOT apply to this booking. This is a private hire contract managed by, and made directly with, a holiday home owner on Peter Bull Resorts site. Back in 2008 I came to Bude for the summer to rekindle with my holiday romance who I met in Bali on a surf trip. 10 years on, a lovely wedding and a wonderful little girl later, the 3 of us now call this beautiful part of the world our home. My husband Ross is a local through and through and has worked on the beaches of Bude as a lifeguard for over 12 years and is now a supervisor of the Bude area. When he is not supervising the beaches he is either enjoying the surf or putting out fires (or retrieving cats from trees!) as he is also a retained fireman. I am originally from the land locked midlands and love living and bringing up our daughter by the sea. We recently decided to open up our property as a small family business so that others can grow to love Bude and the surrounding areas as we do. The caravan is newly refurbished so has a nice clean and fresh feel without the price tag of a brand new caravan. We offer a great value stay in comfortable and cosy surroundings with a unique nautical theme. Perfect stay for our needs. We were made to feel welcome, and thoroughly enjoyed our stay. Our bed was very comfortable, and the shower was fantastic! The whole experience exceeded our expectations of staying in a static. Everything we needed was there. We will definitely return! Really great splash pool and playground for kids. Bude is a lovely seaside town with 3 beaches and a tidal pool, cafes and shops all within walking distance. Amazingly beautiful place to stay. The caravan was beautifully decorated with a seaside feel. Lots of extra little touches to make it home from home. We had a welcoming bottle of fizz and milk in the fridge - thank you Lucy that was most appreciated. Communication was excellent and we had everything we needed. The caravan was well positioned on the camp and the pool was lovely for a dip. We were able to walk into Bude over the headland and had a great time body-boarding. We had a lovely few days away - just wish it could have been longer! Would highly recommend.. Thank you so much for your lovely review John, we are delighted you enjoyed your stay and hope to welcome you back in the future! Gezellige en complete caravan op een kindvriendelijke camping met goede service. Bij binnen komst zeer welkom gevoel door verse bloemen en plaatselijke lekkernij. Eigenaren van caravan zijn zeer goed te bereiken en reageren snel en bieden veel service. De omgeving is prachtig met veel elk wat wils. Strand en stad op loopafstand.